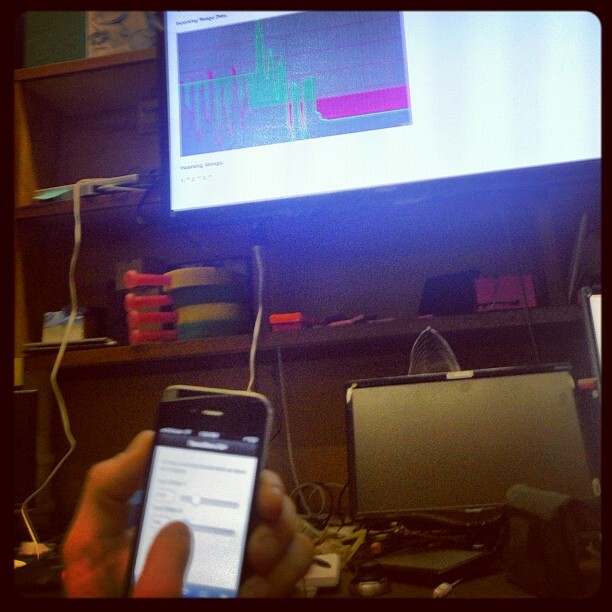 iphone events: web app that forwards iphone accelerometer and gyrometer events to spacebrew. Has not been tested on other phones but should work on phones that support the appropriate html5 features. colored screen: simple app that controls the background color of a browser window. It accepts three range values from spacebrew and uses those values to set the page’s background color. I played around with this sketch by running it on fullscreen on three computers and controlling the color using the iphone events app on my phone. slideshow: simple social slideshow app. It accepts strings that contain urls that point to images and adds new images to the slideshow. The images are played in a continuous loop, and can also be controlled by commands received through spacebrew. text transform: transforms text messages from spacebrew. The user interface enables users to link a “key” message to a “mapped” message (this combination is called a transform map). The app listens for incoming messages from spacebrew. If an incoming message is matched to a “key” message, then the corresponding “mapped” message is sent out to spacebrew. url launcher (chrome extension): controls the navigation of your chrome browser. It accepts a string that contains a url. It also publishes a boolean value when the browser has been idle for a period of time that can be specified via the query string. **disclaimer** this app will seriously take over your chrome browser so read the readme. Ok, it won't harm your machine but it may require that you quit out of chrome and disable the extension to learn how to configure the app via the query string. I hope you find these sketches useful. Let me know if you have any questions (I'll be at the jam tomorrow night). I’ll also upload the arduino and processing sketches over the coming weeks. Josh remotely switches a lamp on with Spacebrew. Josh and James were in Austin, Texas on Wednesday and Thursday for a conference. They took some time from their busy schedules to hack their hotel rooms with Spacebrew. Thank you to InterContinental Hotel for another successful jam! Our November Jam Session is tomorrow from 1PM-6PM. We'll be providing snacks, drinks, and an assortment of electronics and accessories for your hacking pleasure. Hope to see you there! Josh and James jamming across the aisle on their flight to Colorado. Note the graph and sliders with Josh on one side representing software as input and output and the heart-rate monitor and LED bargraph near the camera with James representing hardware. So much fun putting all these hardware and software components together on the fly! Spacebrew Prototypes: Flexible routing between anything that can speak over Websockets, a dynamic interface that allows changes and provides real-time, online, or local accessibility - Spacebrew makes it easy to make things talk.